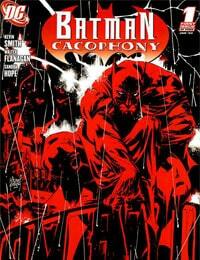 Batman Cacophony Average 0.00/5 - out of 0 total votes. Best-selling comic book writer/director Kevin Smith (GREEN ARROW, Daredevil, Clerks) steps into Gotham City to write this 3-part miniseries event! Practically from out of nowhere, the mysterious masked killer known as Onomatopoeia returns and sets his sights – and sounds – against The Caped Crusader! Readers will be granted access to several villains from the Batman rogues gallery - some you know well, such as the Joker - while others range from B-list to rare. Prepare for some disturbing imagery in this first issue of the three-parter. Smith takes this pool of villains and pits them against each other while all of them have the Batman and the police to also worry about. The major plotline is that someone has taken the Joker's poison and cut down with other ingredients to create a new club drug called Chuckles. It's worse than Xstacy and is taking over the street scene. Needless to say than anyone utilizing Joker "technology" without his express approval is in more than trouble than a copyright lawsuit.